I apologize for not writing an update for a few days. Time seems to get away from me, and the web editor is kind enough not to send me deadlines. Abbot Steve took a walk in the yard this afternoon again today and spent some time talking to David, his old foreman. David and the crew that are here worked for Steve when he owned the landscape design company before Abbot Steve was "Abbot Steve." Currently they are working at the house doing extensive fence and other outdoor repairs. In general, the process of this disease is continuing. Abbot Steve is requiring more and more in the way of pain control, and that affects his entire system. Lane and Abbot Steve are on a very steep learning curve and are in consultation with a number of physicians in order to find a balance between the pain and the side effects that the medications cause. Each day presents a slightly different challenge. Abbot Steve continues to be extremely grateful for all the well wishes he receives and for the chanting that is being done on his behalf. He asks that all these be done not only with him in mind but to all those who are in need. Posted in Uncategorized on October 29, 2013 by Mary Stares. The Green Gulch community holds a daily well-being service in the morning, except on public program days. Tomorrow we will also include Fred Maroth and Daigan Lueck. We all wish you ease and equanimity in this difficult time. Autumn is beautiful here, with all the late flowers and wildlife. May you appreciate your garden! Thanks for your wonderful example, asking us to chant for others as well. My husband, Ming, and me are having a bit of a hard time, so I've been dedicating it to us too. Feels a little funny to dedicate merit to one's own life and relationship. Please pass on my love and gratitude to Steve. I just heard about his current challenge from a friend. Steve's courage and passion are an inspiration to all. 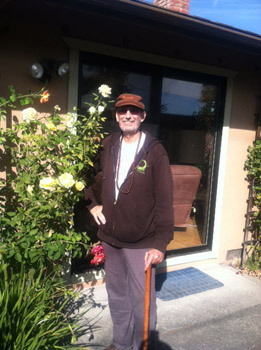 I first met Steve when I visited Tassajara after the big fire and was asked to help the Zen Center develop a balanced and rational approach to fire risk reduction. Steve was always there to provide a guiding hand and to keep the conversation focused on what really mattered - love of place and the love for each other. It is an honor to say I know Steve and had the privilege to work with him. It is so amazing that Abbot Steve is in this place at this time, so soon after walking miles every day and sleeping outdoors with us. I think of him often. And I dedicate merit for others as well as for him - a little lopsidedly. My sister is doing the same path. I realize that I almost missed him in my time at SFZC. What good fortune for me that we finally met.